Buy Online from Nordic Creamery for the Best Tasting Butter & Award Winning Wisconsin Cheese in the Country! We offer a variety of handcrafted cheeses and butters made from some of the best and freshest goat's and cow's milk in the region. 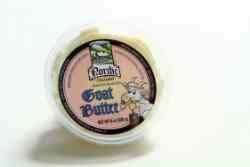 Our goat and cow's milk have met the highest standards in Wisconsin. Buy our handcrafted cheese on-line and you'll experience some of the finest cheese made from hard work and love. Nordic Creamery - Just wins big at the World Championship Cheese Awards! Nordic Creamery™ artisan butters are crafted by Al Bekkum, a long-time licensed Wisconsin buttermaker and cheese crafter. Just like his specialty and artisan cheeses, Al is really persnickety about his milk sources... both goat and cow milk... for his collection of artisanal butters. At the 2018 World Championship Awards Nordic Creamery took home the gold. Capriko is an award-winning, semi-hard cheese made from a blend of fresh goat and cow milks. Muenster, our Muenster is a semi-soft goat’s milk cheese that takes Muenster in a slightly different direction. 1# package of some fabulous homemade amish candy. Locally made and handcrafted fresh. 6oz. Chunk of a great tasting Feta made from the highest quality Sheeps Milk, single source farm in Wisconsin. Order Wisconsin cheese, gift baskets and gourmet gifts online! Nordic Creamery delivers all natural butter, cow and goat cheese (for lactose intolerance) individually or in a variety of gift boxes to your home or office anywhere in the greater Chicago area, Wisconsin and the continental US.